It is the main event of the Sappada winter. Tradition and folklore, a wish for fun and plays, leading to a special event and attracting children, tourists and local residents all the same.The Carnival in Sappada is anticipadted by the preparation involved that puts to work the local associations. 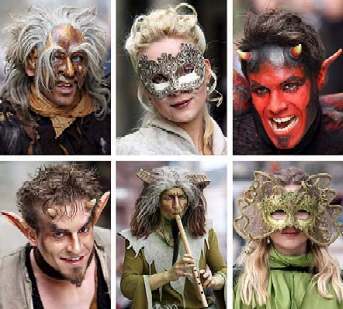 It is different from other events of the kind because it lasts longer and it is certainly the biggest ever with many people wearing wonderful fancy dress costumes. There isn’t anything less here than in the most famous Carnival parades of Italy or Europe as far as history and tradition are concerned. Furthermore it is a Carnival with no class divisions and yet it depicts the social life of the past divided into three Sundays: the Sunday of the poor (Pettlar Suntag), that of the framers (Paurn Suntag) and that of the rich (Hearn Suntag). After that the Shrove Monday comes whilch is dedicated to the "Rollat". On the Mardi Gras day and again on the Thursday before Lent it is time for the Carnival floats. That is the role of the masker simbol of the Sappada Carnival. His mask is made of wood, a scarf around the neck, a sheepskin over the shoulders for this protagonist of the parade. in fact the long parade through the crowd along the village is started by this important figure. The rollen, which are bronze wheels worn around his hips as a belt, announce that he is approaching. The name Rollat comes precisely from these wheels. A serious masque to be afraid of and hence attracting attention and regards.